electronic communication. 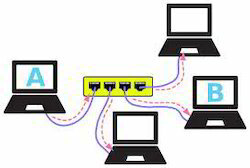 Computers on a network can be connected through twisted pair cables, telephone lines, radio waves, satellites or optical fiber cables. The first computer network designed LAN, WAN . However, currently there are multiple networking technologies in use which have been enlisted below. Looking for Lan Networking ?